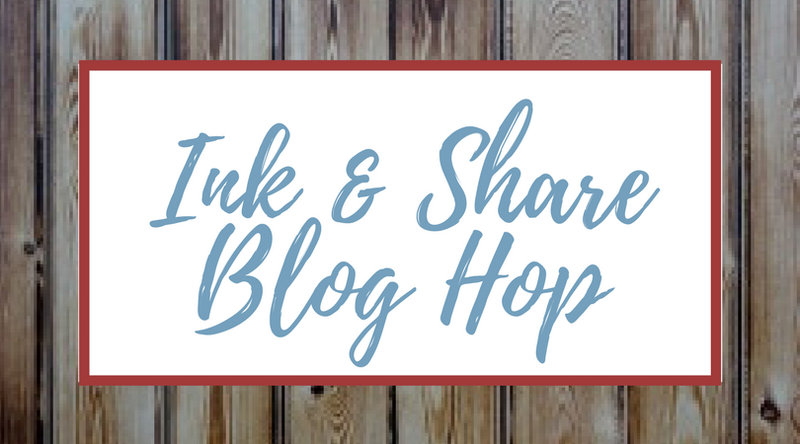 Hello world and welcome to my blog on this glorious sunny morning! Such a difference to the last few weeks with snow dominating everyone's lives here in the UK. Let's hope Spring is finally here. This week is all about celebrating two special birthdays with my work colleagues. 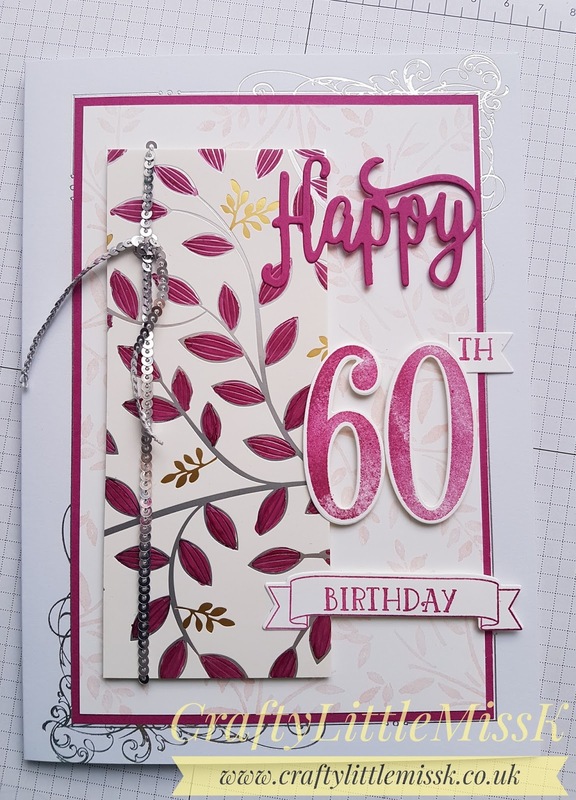 Both turn 60 within a week or so of each other so I dragged out the Bigshot and my large number dies and stamps to create these cards. 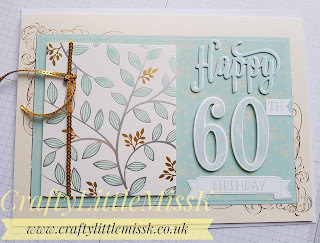 Based on a card sent to my dear friend Anne over on Copper Beech Crafts for her Stampin Up 6th anniversary. 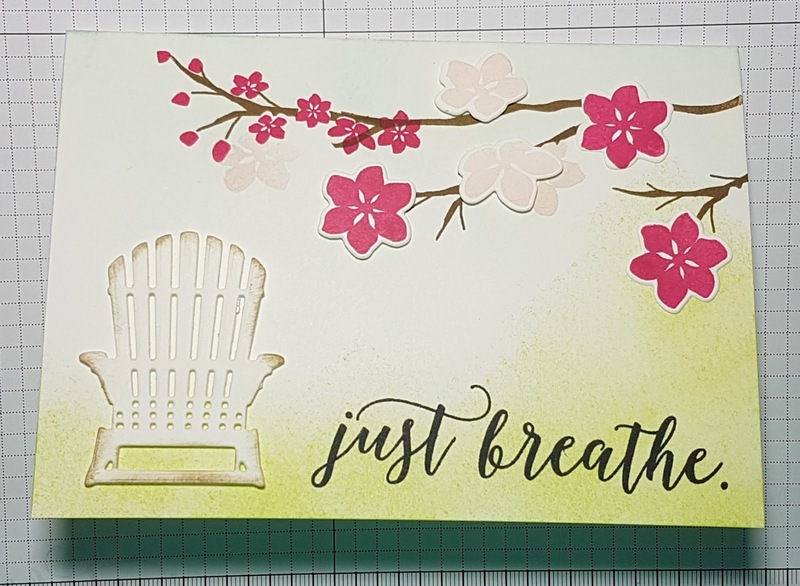 This card was made using Berry Burst ink and a piece of gorgeous foiled card (free with Sale-a-bration, Stampin Ups annual sale). 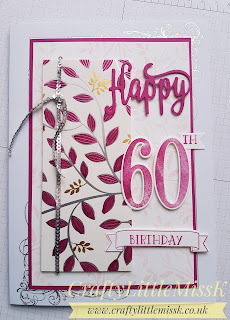 The card base with the silver swirl is from a stash of cards I've had forever! 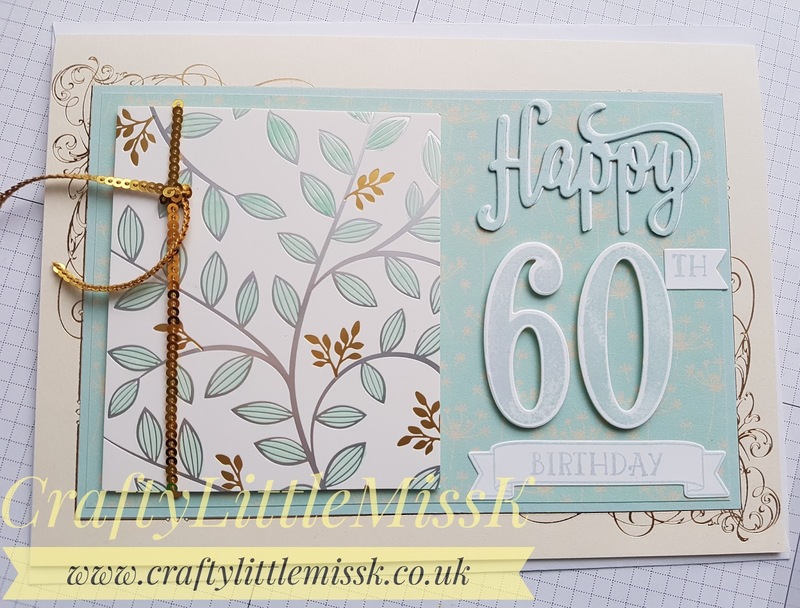 This card was made using Soft Sky ink and more of the foiled card. The mini sequins on both are also SU supplies. Welcome to CLMK land again. 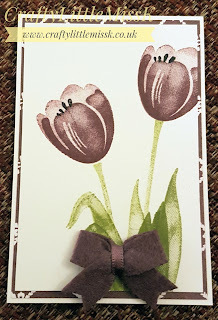 This time I'm using an older stamp set - Tranquil Tulips. First of all I made an ATC (Artist Trading Card) for a monthly swap I take part in. This year it's simply the months of the year. As it's now March, and supposedly the start of spring, I took inspiration from my dad's little garden. His black tulips from last year are starting to grow, despite all the snow we've had. They were truly beautiful last year - tall, dark and majestic. I loved them. 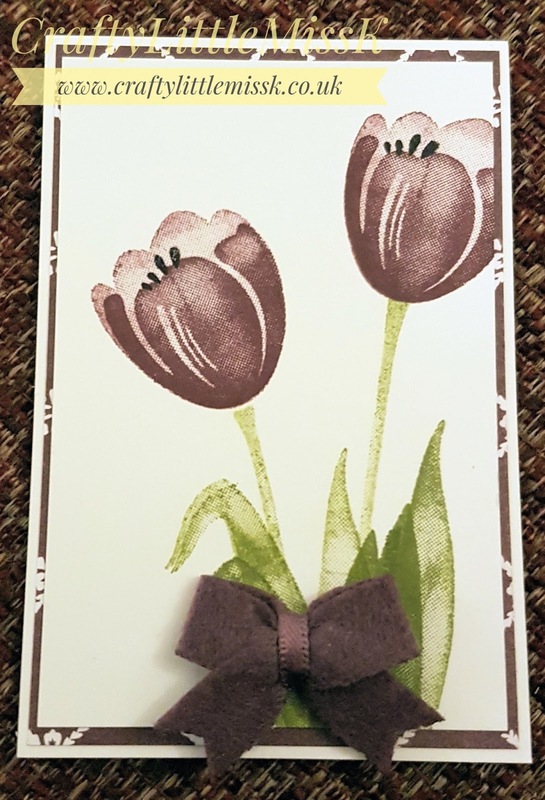 So my ATC had to feature tulips. Then of course I had to decorate the envelope. The ATC looked a bit lost in the envelope so finally I put together a quick card, left blank for the recipient to use. 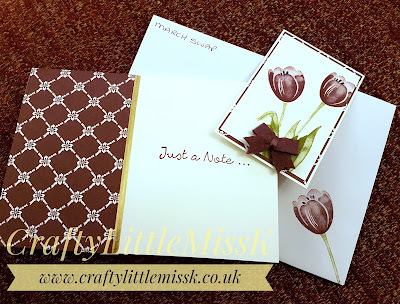 I do love how the colours all match - from the ink, to the paper, to the cardstock! Let's hope Spring truly is here and that the snow for this winter is finished. Hi! 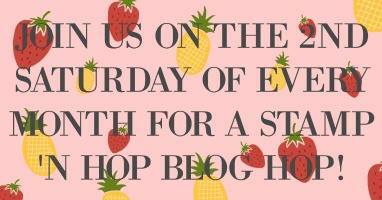 - a big fat hello and welcome to my blog. 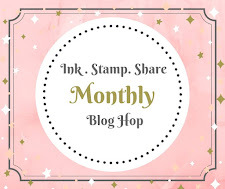 This week I am taking part in a Stampin Up! 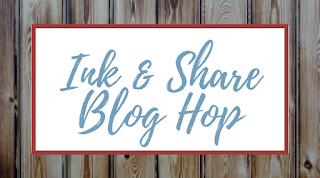 Demonstrator Blog Hop, where demos from all around the world get together online to create some wonderful things - this time using supplies from the 2nd release of Sale-a-bration goodies. For anyone visiting today who doesnt know, Sale-a-bration is a yearly event where during January to March you can claim free craft goodies with a minimum spend of £45 (in the UK). This year, I believe for the first time, Stampin Up! have offered a higher tier of goodies for a spend of £90. If you're reading this, would like to order, or just know more, I would be very happy to be your demonstrator. Please contact me using the link down the side. Now, let's get on with this months Hop! If you've hopped in from Tracy, I'm sure you're already feeling inspired! 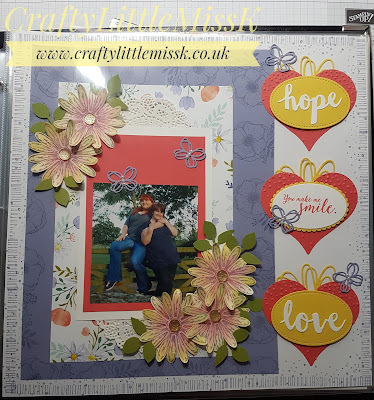 She makes some lovely projects. After you've stopped by here, please do go on to Christina, who will no doubt inspire you even more! And do look out for Andre's project further round the hop. I've had a sneak preview and I know you'll love what he's been dong this month. 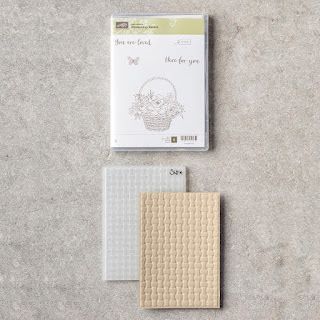 As seen in the title, I am featuring something from the 2nd release - the Basket Weave embossing folder. 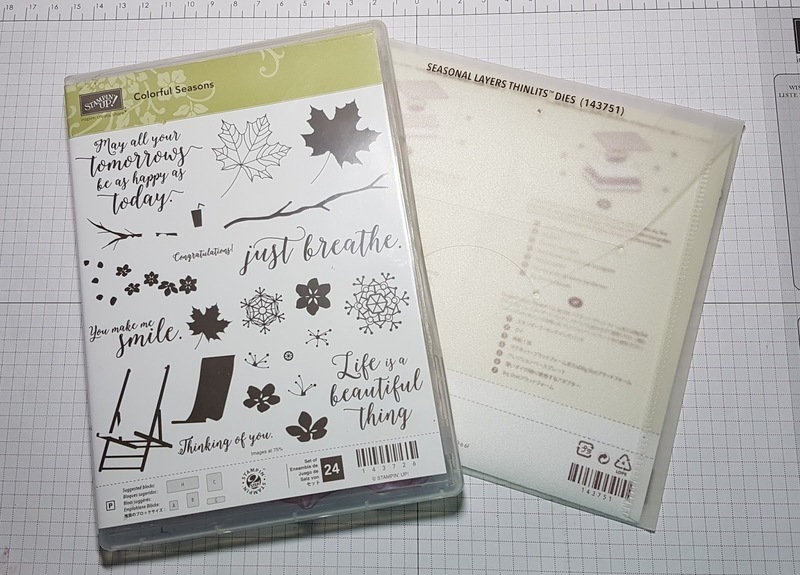 This comes as a bundle with the stamp set and is in the higher tier. 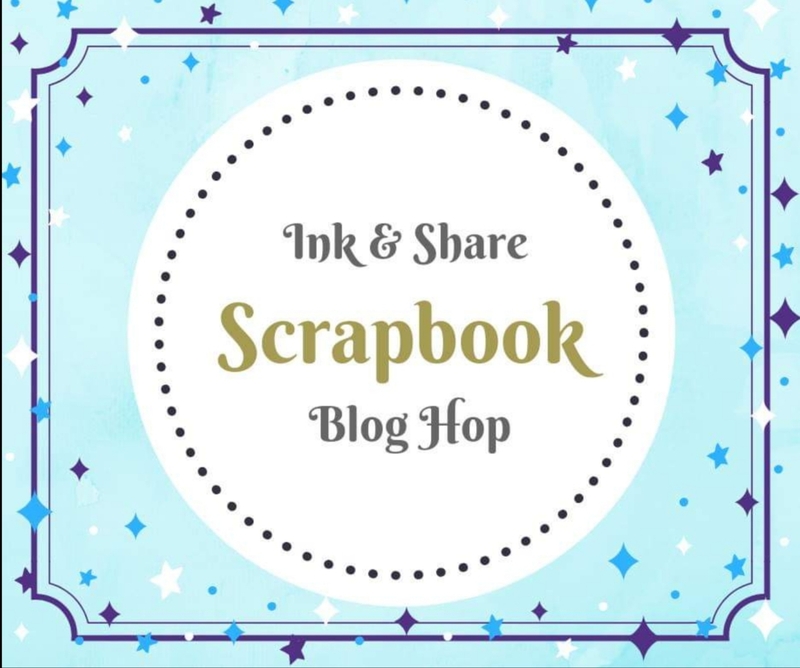 The embossing folder is really thick (you only need one plate on your Big Shot), and makes a beautifully deep impression on your card stock. 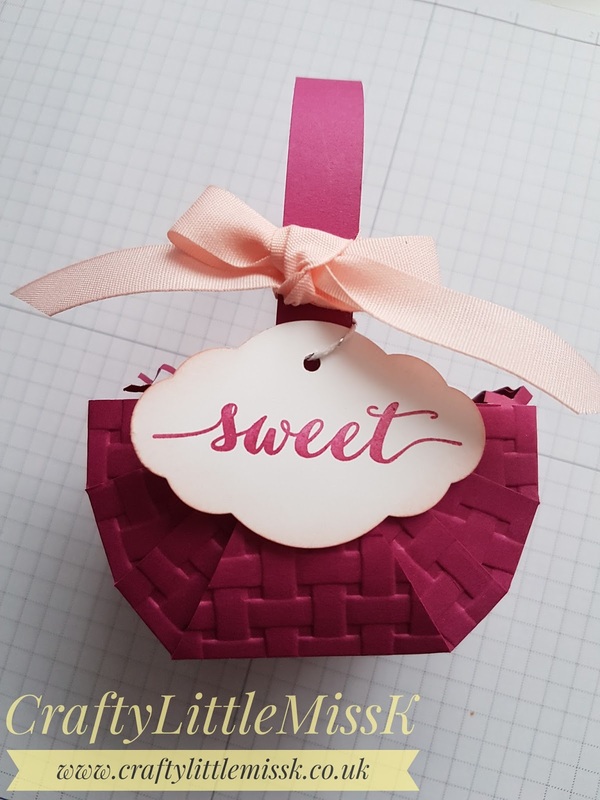 With Easter almost upon us, I wanted to create some pretty mini egg filled little baskets for the grown ups in the family. The grandchildren will have their usual Egg hunt. I've been wanting to make some of these baskets after seeing them on Pinterest. The larger basket is made using a piece of card 6" x 6"
Score @ 2" and 4", turn and repeat creating a grid of 9 squares. Then score down in outer two areas just to first score line @ 5/8", 1 3/8", 4 5/8" and 5 3/8". Turn 180° and repeat. The smaller basket is made using a piece of card 5" x 5"
Score @ 1 1/2" and 3 1/2", turn and repeat. Then, in outer 2 areas score down to first score line as follows 1/2", 1", 4" and 4 1/2". Turn 180° and repeat. 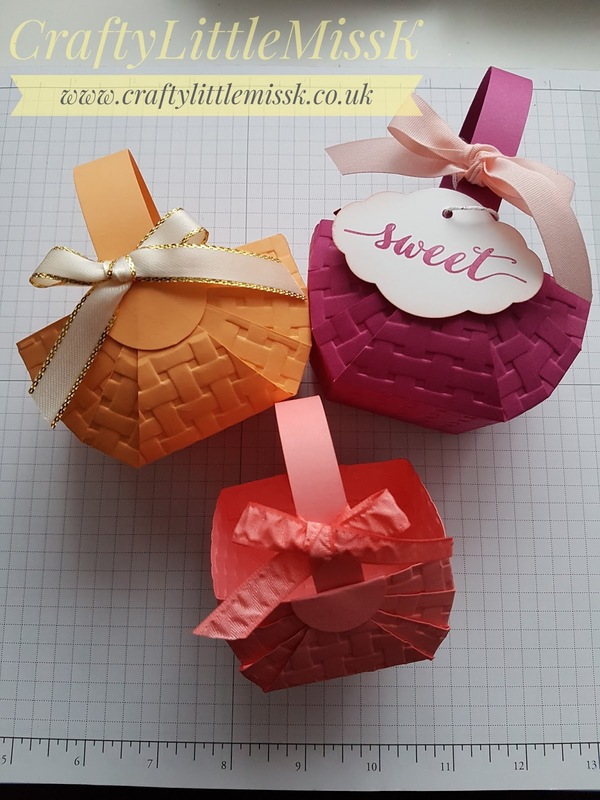 Please see my YouTube video for more details how to finish the baskets. If any of my Slimming buddies see this, forget what you hear! I was chatting away forgetting some of them watch my videos!! 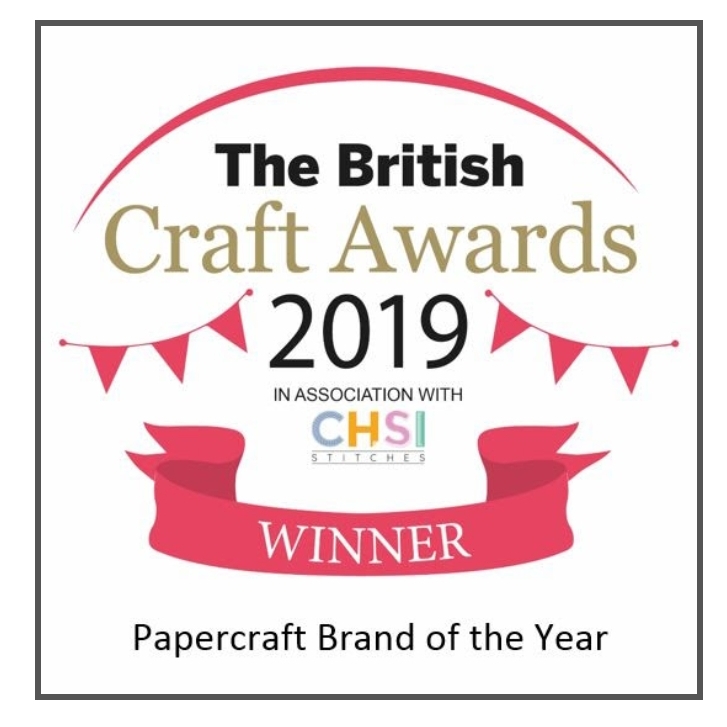 I haven't done any papercrafting for a while. I've been too busy knitting. During last week with all the cold weather and snow all I wanted to do was huddle on the sofa with my feet up. So I did - at least on my days off. The photo is of my niece and I a few years back. The embellishments are daisies, using the Daisy Punch. The Sweet & Sassy dies and the Stitched Shape Framelits. 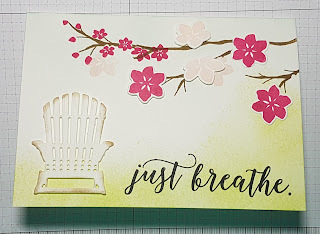 I also used the layering ovals, the leaf punch and the Sunshine Wishes dies. I stamped round the edges of the 12x12 white card and also a floral border round the lilac card. Faceted gems finished off the daisies after I'd sponged some colour onto them. This took a while to complete as I kept changing my mind about colour, but will be a quick make for my ladies on Tuesday.